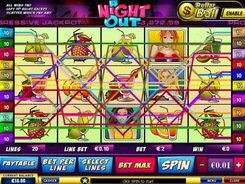 The brightly colored Easter Surprise slot game with cartoonish graphics has a five-reel twenty-line set-up allowing you to bet up to $10 per each payline. So, the wager in this slot machine can extend to $200. You will come across the symbols of Easter eggs, Easter bunny, traditional playing cards decorated with ribbons, and other holiday-themed icons. 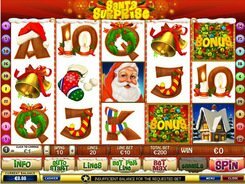 Winnings are paid for combinations of matching symbols on an active payline. The maximal prize of 10,000 coins is granted for five Easter Bunnies with gift boxes in their hands. The Bunny is the wild card with typical substitution capabilities. The scatter is represented by the game logo. 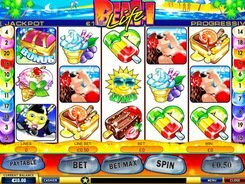 No matter where exactly they appear on the reels, two through five scatters pay out x2–x50 times the total bet per spin and give you access to 10 free spins with a x3 multiplier. 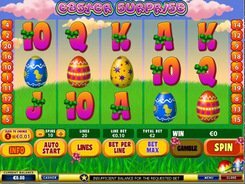 Three baskets filled with eggs (Bonus symbols) launch a “pay’em up” bonus game with the funny bunny offering you to select three of six eggs. Each egg contains a generous cash reward that will add in your bankroll after the bonus feature is finished. PLAY FOR REAL MONEY!